LANA necklace from the Get Personal Collection. Signature 14-karat gold flat-link chain. 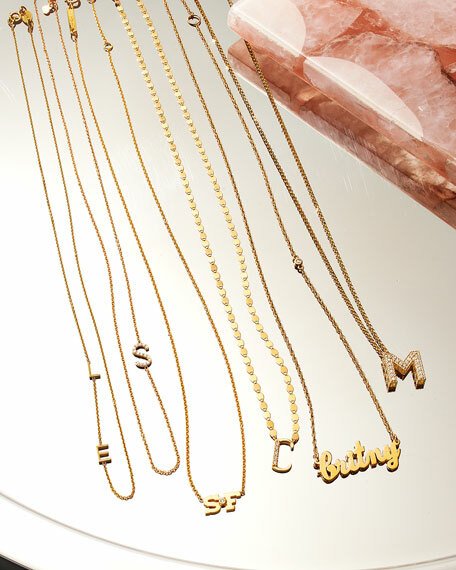 Your choice of initial pendant with white diamonds. Ashley Pittman "Upendo" lariat necklace. Yellow-golden link chain. Dark horn ends with pink ruby, rose quartz, red garnet, and pink coral studs. Approx. 70"L. Handcrafted in Kenya. Jose & Maria Barrera long beaded necklace. Signature 24-karat yellow gold plating. Multi-size and multihued stone beads. Dyed jade and cloisonn?? beading. Abalone and glass simulated pearls. Fold-over clasp. Approx. 48"L. Made in USA. Jose & Maria Barrera three-strand necklace. 24-karat yellow gold-plated hardware. Mixed beads, including agate, cloisonne, carnelian, and faceted glass. Approx. Jose & Maria Barrera three-strand necklace. 24-karat yellow gold-plated hardware. Mixed beads, including agate, cloisonne, carnelian, and faceted glass. Approx. 19"L; Hook clasp with 2" chain extender.